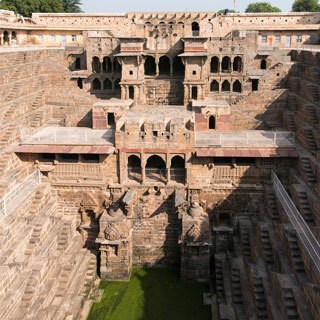 Chand Baori is a stepwell and one of the oldest and most attractive landmarks in Rajasthan. It was built by King Chanda of the Chauhan Dynasty between AD 800 and AD 900 and was dedicated to Hashat Mata, Goddess of Joy and Happiness upon completion. The state of Rajasthan is extremely arid, and the design and final structure of Chand Baori was intended to conserve as much water as possible. At the bottom of the well, the air remains 5-6 degrees cooler than at the surface, and Chand Baori was used as a community gathering place for locals during periods of intense heat. One side of the well has a pavilion and resting room for the royals. This article uses material from the Wikipedia article "Chand Baori", which is released under the Creative Commons Attribution-Share-Alike 3.0 License.